Welcome to another of my Monthly Musings where I tell you what I've been up to and what my immediate plans are. As ever, I start with a picture of Vampirella. I'm showcasing the work of Spanish artist Manuel Sanjulian this year, who painted many a front cover of the old Warren Publications Vampirella monthly magazine in the 1970's. I have to admit that I have no idea who the woman with the sword standing behind Vampi is. She is not a character I recognise. Quite often the front cover illustrations bore no relationship to the comic strip inside the magazine, but this particular painting was never used as a front cover. Obviously I like it but I am curious to know more about what is going on here. The most frustrating part of this past month was being without my computer for ten days after it developed a fault and had to be taken away to be repaired. However, as a result, my painting and modelling output increased considerably. Without the Internet to distract me, I got a heck of a lot of work done. My modelling output has been exceptionally prolific these past few weeks. I have been making more buildings for my Wild West projects, all from 4Ground. For sure, their buildings are expensive, but really, you're paying for quality. Plus, with them coming pre-coloured, the time saved not having to paint them is invaluable. I am now at the stage where I have enough buildings to post my first Wild West batrep, which I'll be playing soon. I'll be using the original Six Gun Sound: Blaze of Glory rules, playing a simple Confrontation scenario between two groups of outlaws. I have also been buying, painting and making furniture items for my buildings. I've bought some resin furniture packs from Great Escape Games for their Dead Man's Hand range, and some resin and MDF sets from TT Combat. In addition, I've been making lots of Stoelzel's Structures card furniture items. Thanks to my good friend, Greg aka Wargame Addict, I've purchased four Corvus Belli Infinity scenery packs to use in my Judge Dredd Miniatures Game. Greg had used some of the items from the Neon Lotus set as a backdrop for a few of his Blade Runner figures and as soon as I saw them, I thought of Mega City One. Greg advised me to purchase them from eBay, which turned out to be good advice. Each of these four sets cost me just £7.65 from The Troll Trader, who has the Buy Now option, which I love. Post and packing was free and they arrived very promptly. Each set contains four rectangular buildings, six container units and a map made of paper. In each pack, the buildings come in two designs and the container units in three designs, so you do get duplicates of each one. The buildings and container units are made of thin card. Greg described them as "cheap and cheerful" which is spot on. However, I have reinforced my buildings and container units with 5mm thick foam-board, making them very strong and sturdy. I also made them so that the roofs are detachable, but none of them have any interior detail. I'm really not sure if it's worth the effort giving them interior detail or not. They work well enough as empty shells. The set above is the Hephaestus scenery pack, which is a research and/or science park. This set is the Mototronic scenery pack with a mixture of offices and power plant buildings. This next set is the Navajo Outpost scenery pack, which is a military outpost. Finally, is the set that Greg has, the Neon Lotus scenery pack. This is obviously an urban set-up, with shopping centres and hotels. Instead of container units it came with four smaller, square buildings and two overhead walkways. From a gaming perspective, this is the most useful set. I have made all of the buildings and all of the container units, something I'd never have got done if my computer hadn't malfunctioned. That was time well spent and was incredibly productive. I do like the buildings and you can never have too many container units. The sets are well designed but I acknowledge that they won't be to everyone's taste. I'm glad I went the extra mile to reinforce them. However, my one major criticism of them is that the maps, whilst a nice size (about 2 feet by 3 feet) are very flimsy, being made of paper. I don't think I'll be using them very often. As for figure painting, once again, I got a lot of figures finished this month, which is most pleasing given how many unpainted minis I have. Almost all of the figures I painted this month were Wild West themed. As well as humans I've also been painting scenery items (cacti and furniture) as well as animals and birds - dogs, buffalo, prairie wolves, rattlesnakes, a hawk and some vultures. I'm busy painting a bunch of bears - black, brown and grizzly. I feel I need more horses, both saddled and unsaddled, so they're high on my shopping list. I'll be showcasing all of these newly painted figures next month. It still has a few days left to run and is fully funded. If you are interested in this game, you'll be pleased to know that it comes with a huge amount of free stretch goals, making it even better value for money. 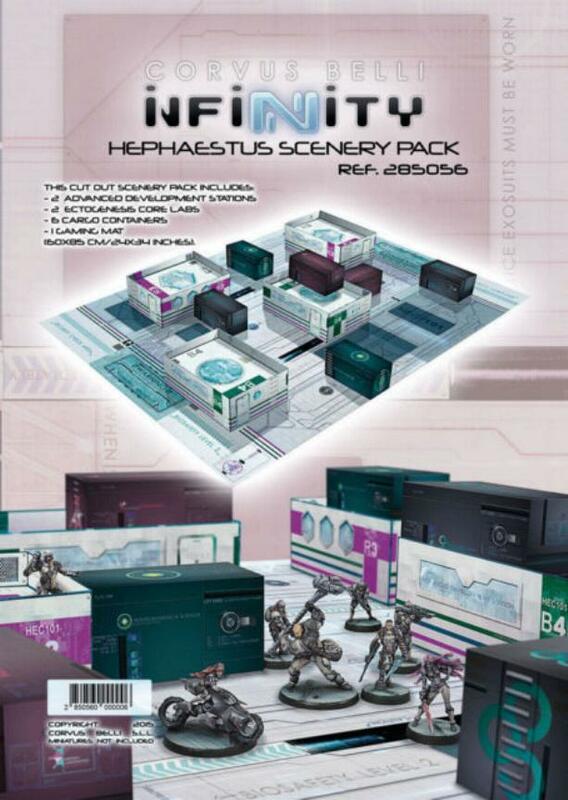 In addition, there are numerous add-ons as well, including two big expansion sets, which I will be buying. Did I mention how much I love Zombicide? I have to admit that I am not a big fan of Games Workshop 💩 and for most of this century I have avoided their products. But when they released a new version of Necromunda last year, I got quite excited. This was one of my favourite GW games of old and the fan boy in me wanted to revisit it. 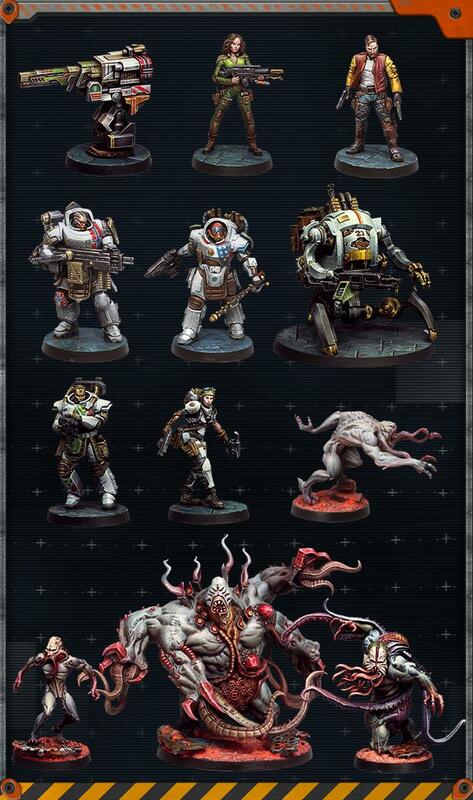 So, these past few months I have bought most of the products for this game, although not from Games Workshop. I still refuse to buy from them when companies like Element Games or Wayland Games sell their products much cheaper, generally 20% less than the RRP. Whilst I was browsing for scenery to use in Necromunda I discovered a boxed set that although was marketed for Warhammer 40,000 would work perfectly in Necromunda. That set was called Sector Imperialis Objectives. 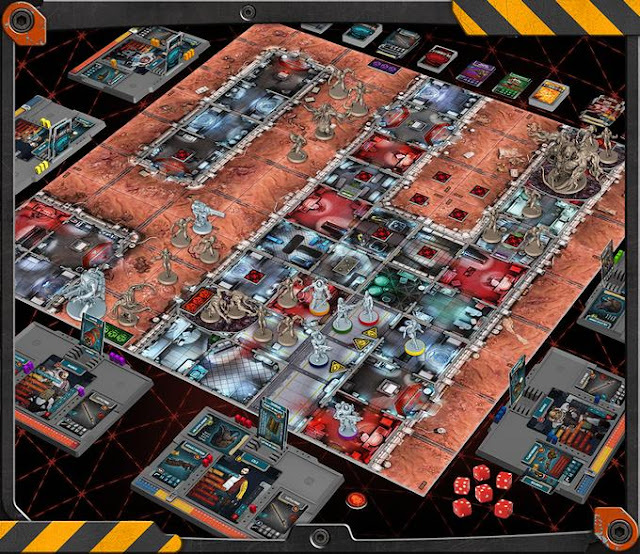 It contained 12 multi-part plastic objectives that I thought had loads of gaming potential - not just for Warhammer 40,000 or Necromunda but also the Judge Dredd Miniatures Game or just about any sci-fi game. Let's take a look at what you get with this set. First up are three supply dump ammo crates. From left to right these contain mortar shells, artillery shells and ammo boxes. 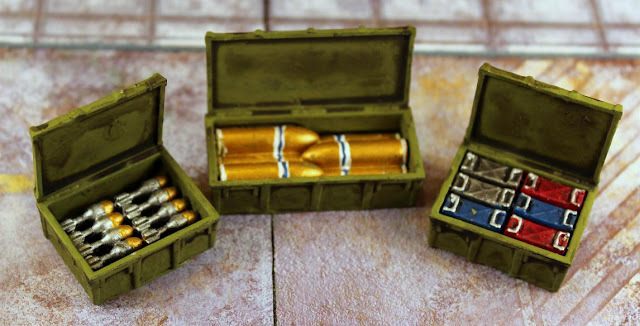 Unlike the lids on the supply crates you get with the Necromunda scenery set, these are not designed to be open or closed. They must be glued in place. I'd have preferred if they could be removable but it's not that big a deal that they can't. The two black "bombs" are listed as supply dumps. I admit that when I first saw them I thought they were big bombs. I suppose they could be either depending on what you want to use them as. 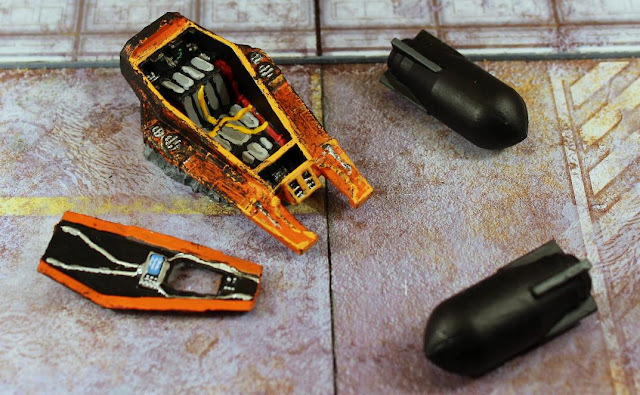 The other objective is a Lucius Pattern Escape Pod. The blackening on it came from when it entered the planet's atmosphere from space. The hatch covering the engine and the hatch covering the cockpit are separate. I glued the engine hatch in place but not the cockpit hatch. My photos show it fitted in place and separate. It is designed to hold one human or humanoid occupant. Next up is an Orbital Vox Array, which is another way of saying it is a communications beacon and/or relay. In the centre is an Administratum Cogitator Shrine, which is Imperial gobbledegook for a computer station. 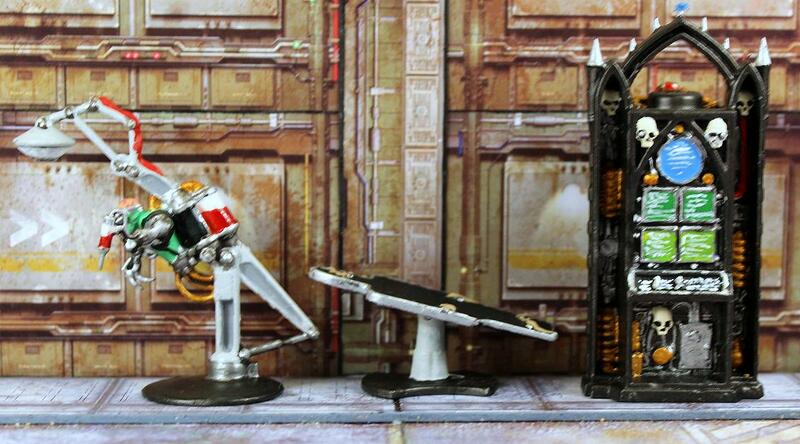 At the far right is an Exterminatus Device aka a bloody big bomb. Note that the countdown clock on it (an absolute must have!) reads 007 - a deliberate nod to James Bond. I love this objective. I can see it being used in so many games. Moving on, we have the Field Medicarum and examination bed. I was going to say that the Field Medicarum is a robo-doc but it has a human brain that is clearly visible so, technically, it's an android. This is another of my favourite objective items. Finally, is the Xenos Stasis Crypt. This comes with a clear plastic door, which I haven't glued in place. It's actually quite a tight fit. 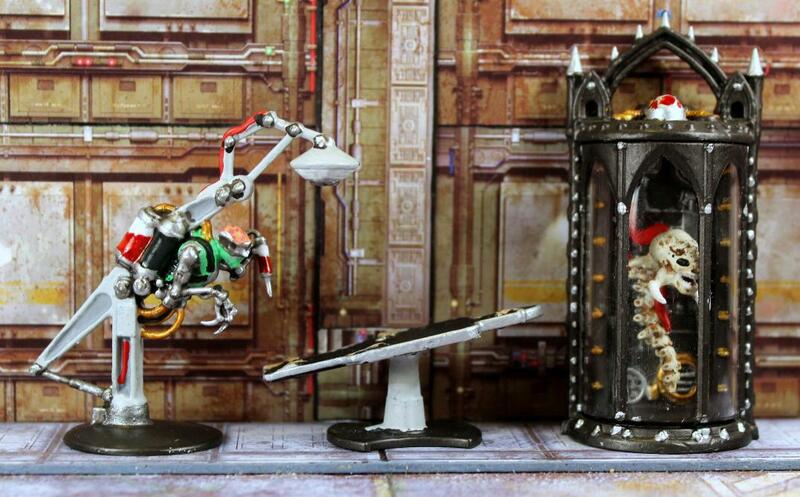 Inside the device are the skull and spine of a Tyranid Genestealer. This is another great model. Readers of my WOIN blog will probably recognise these last two objectives as they recently appeared in my current Alien Base scenario. I plan on using these in my Necromunda campaign as either alternative gang relics or objectives in their own right. As I said above, I've already used some of them in my The Ace of Spades Campaign for WOIN and I'm sure they'll also appear in my Judge Dredd campaign. Surprisingly, for a Games Workshop product, this set is relatively cheap, costing just £20.00. However, if you want it, I'd advise buying it from Wayland Games, who currently have it in stock for just £16.00. That's what I did. 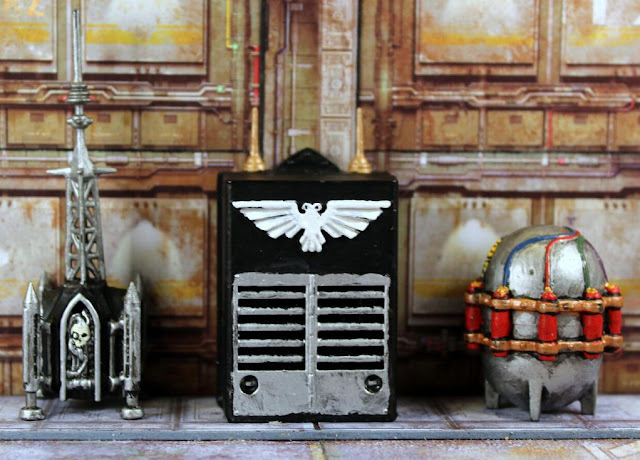 I have finished painting all of the scenery items that I got with the Necromunda starter boxed set. In this post, I'm showcasing the smaller items. The doors and barricades will appear in a later post. Without further ado, here they are. You get four crates in the set and they have been very cleverly designed. They are double-sided with separate lids. On one side, two of the crates are loaded with guns, and another two are filled with ammo. The guns in the crates are identical, as are the two ammo crates. I painted the guns in different colours for some variety. I have placed a lid on top of one of the ammo crates to show what it looks like in situ. The reverse side of the crates are blank, as shown by the crate at the far right. However, you do have the option of adding booby traps to them. From left to right are a Frag Grenade trap, a Melta Bomb trap and a Gas Bomb trap. The only way to find out what is in a crate is to open it. I like this element of uncertainty, although if you're using booby traps, you should know where you've placed them. At the far left are a pair of door terminals, used for locking or unlocking doors. The set comes with four of these terminals. To show that a door is locked, they can be placed on both sides of a door or only one side, thus making it very secure. I have stuck my terminals onto 20mm diameter MDF bases. The scenery item second from the right is a gang relic. A gang relic always belongs to one gang or the other; if the scenario has an attacker and a defender, the relic belongs to the defender. Add 2 to the Cool and Leadership checks for fighters while they are within 6" of a gang relic owned by their gang. I stuck my relic on a 20mm diameter slottabase. Finally, at the far right is the beast's lair. Only one of these will ever appear in a scenario, and then only if it is part of the scenario. The beast can attack any fighter who starts or ends a move within 6" of it. The beast is very fearsome indeed. It attacks with Strength 6, AP -2, Damage 3 and has the Knockback trait, originating from its centre. Fighters can attack it but must subtract 2 from their to hit rolls. The beast has Toughness 4 and 3 Wounds. If its wounds are reduced to 0 it is removed from play. Although designed for use with Necromunda, I see no reason why these items couldn't be used in other games. Being without my computer for ten days was a major bummer, but on the plus side it did allow me to spend a heck of a lot of time on my gaming hobby. I've been painting lots of Wild West figures as well as making buildings and scenery for my upcoming Weird and Wild West projects. I mentioned in a recent Monthly Musings that I had received over 100 figures for the Black Scorpion Tombstone Kickstarter project. I also already had quite a few other Tombstone figures that I'd bought before the Kickstarter began. With so many figures to paint, I decided I had to make a start on getting them painted. 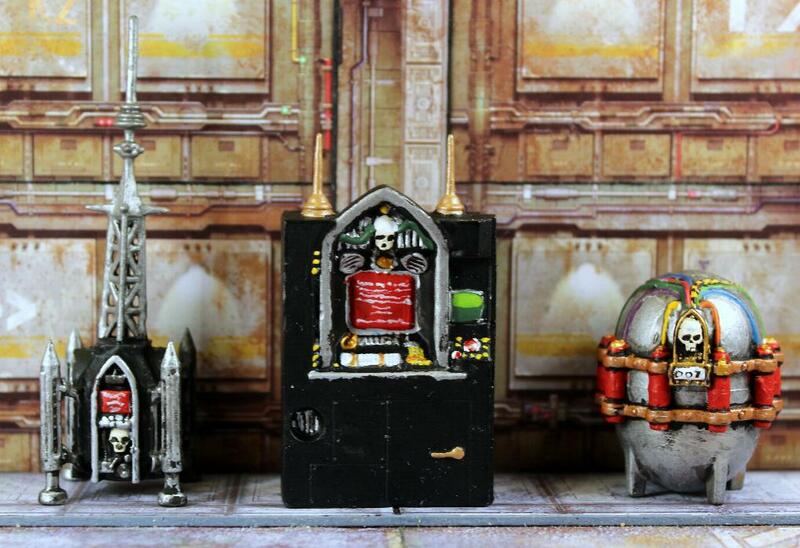 Let me just say right from the start that I absolutely love the Black Scorpion range of resin-cast Tombstone figures. The detail on them is amazing and they are simply a joy to paint. In this post I'm going to concentrate on some of the Lawmen figures, starting off with the Earp brothers and their good friend, "Doc" Holliday. This picture above was taken from the Black Scorpion webstore and shows the original sculpts for the three Earp brothers and "Doc" Holliday. I'll be honest, I think they are just okay. Not bad, but not brilliant either. Perhaps, sculptor Adam Clarke, felt the same way because last year he re-sculpted them and produced these four superb figures you see below. In my opinion, they are a vast improvement over the originals. They look far more dynamically posed. I think the new "Doc" Holliday figure is outstanding. From left to right are town Marshal Virgil Earp, his two deputies, Morgan and Wyatt Earp and John "Doc" Holliday, who at the time of the famous Gunfight at the O.K. Corral, was appointed as a Special Policeman by Virgil, essentially meaning he was also a deputy.The Earps are all armed with two Colt .45 Pistols and "Doc" is armed with a 12g Shotgun and a Colt .45 Pistol. The Gunfight at the O.K. Corral was a 30-second shoot out between lawmen and members of a loosely organized group of outlaws called the Cowboys that took place at about 3:00 pm on Wednesday, October 26, 1881, in Tombstone, Arizona Territory. It is generally regarded as the most famous shootout in the history of the American Wild West. The gunfight was the result of a long-simmering feud, with Cowboys Billy Claibourne, Ike and Billy Clanton, and Tom and Frank McLaury on one side and the Earp brothers and "Doc" Holliday on the other side. All three Earp brothers had been the target of repeated death threats made by the Cowboys, who objected to the Earps' interference in their illegal activities. Billy Clanton and both McLaury brothers were killed. Ike Clanton claimed that he was unarmed and ran from the fight, along with Billy Claiborne. Virgil, Morgan, and Doc Holliday were wounded, but Wyatt Earp was unharmed. The shootout has come to represent a period of the American Old West when the frontier was virtually an open range for outlaws, largely unopposed by law enforcement officers who were spread thin over vast territories. Moving on, we have another real life lawman, Sheriff Patrick Floyd Jarvis Garrett, better known as "Pat" Garrett. He achieved fame by pursuing and eventually killing the notorious outlaw, William "Billy the Kid" Bonney on 14 July, 1881. In November of 1880, Garrett was elected as sheriff of Lincoln County, New Mexico. Although Garrett's term would not begin until January 1, 1881, he was eager to capture the fugitive "Billy the Kid", and persuaded Sheriff Kimball to appoint him a deputy sheriff for the remainder of Kimball's term. Garrett was further aided when he obtained a deputy U.S. Marshal's commission, which allowed him to pursue the Kid across county lines. Garrett and his posse stormed the Dedrick ranch at Bosque Grande on November 30, 1880. They expected to find the Kid there, but only succeeded in capturing John Joshua Webb, who had been charged with murder, along with an accused horse thief named George Davis. Garrett turned Webb and Davis over to the sheriff of San Miguel County a few days later, and moved on to the settlement of Puerto de Luna. There a local tough named Mariano Leiva picked a fight with Garrett and was shot in the shoulder. On July 14, 1881, Garrett visited Fort Sumner to question a friend of the Kid's about his whereabouts and learned he was staying with a mutual friend, Pedro Menard "Pete" Maxwell. Around midnight, Garrett went to Maxwell's house. The Kid was asleep in another part of the house, but woke up in the middle of the night and entered Maxwell's bedroom, where Garrett was standing in the shadows. The Kid did not recognize the man standing in the dark. He asked him, repeatedly, "¿Quién es?" (Who is it? ), and Garrett replied by shooting at him twice.The first shot hit the Kid in the chest just above the heart, killing him. He is armed with two Colt .45 Pistols. The final two figures are fictitious figures created by me. Wearing the black duster is Marshal Kingston Regis, a patient and determined man, who has some experience in the latest detective techniques. He is armed with a .44 Winchester Rifle and a Colt .45 Pistol. At the far right is Sheriff Harrison Coburn, who is actually from the Black Scorpion Collectors range and not the Tombstone range. He is ambidextrous. He has a Knife tucked in his left boot and he carries a 12g Scattergun in his left hand. The long-barrelled pistol held in his right hand is a .45 Colt Buntline Special with its 12" long barrel. The gun was allegedly used by Wyatt Earp, but there is hardly any evidence to show that this was true. 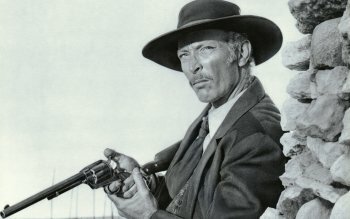 Fans of old Western films may remember that Colonel Douglas Mortimer (played by Lee Van Cleef) used one in the film, For a Few Dollars More (see picture below). I have created character cards for all seven of these lawmen to use in Six Gun Sound. I'm building up quite a cast of characters for this game, which I hope to showcase real soon. You can buy six of these seven figures from the Black Scorpion webstore. The Earps II cost £9.60 for all four figures, Pat Garrett costs £4.50 and Sheriff Coburn costs £4.50. The unnamed lawman figure whom I called Kingston Regis is not currently available. Hi, folks. First of all, an apology for my lack of posts this past week or so. I have had some serious problems with my computer and it had to be taken away to get repaired. This is the second time in the past seven months I have had computer problems. I am thinking it might be time to get a new computer sooner rather than later. Anyway, I should get back to blogging again very soon as I have a load of new material to show you. Also, I will be spending most of this afternoon checking out the blogs I follow and commenting on them as normal. Ten days without my computer felt like an eternity. On the plus side, I got a lot of painting and modelling done, so it wasn't all bad news. You'll be seeing the fruits of my labour on my blog. For those of you who e-mailed me to enquire about my absence and my health, many thanks. I really appreciated it. Let me reassure you all that my health is fine. Alas, the same could not be said about my computer. Kindest regards from Bryan aka Vampifan. Still sticking with Shadows of Brimstone, here are four more Heroes to use in the game - the Frontier Doc and the Jargano Native, both with male and female versions. I recently bought these four figures from a seller on eBay for a very reasonable price. He had glued them, painted them and stuck then on two pence pieces. I don't know what he glued them with (probably polystyrene cement) but they just came apart in my hands. Also, the paintwork was sloppy and amateurish. The basing was unusual but I went along with them, although I did add my own sand and gravel to the bases. I used superglue to stick the figures back together, which is recommended for resin figures and gave them brand new paint jobs. I am very happy with how they turned out. If there's one thing that the Old West frontier is known for, it's being deadly! Whether it comes from the barrel of a gun, the bite of a venomous snake or being crushed by the constricting grip of a slimy tentacle, death lurks around every corner. That's why frontier docs are so commonplace throughout the West. They may not be the toughest or the fastest, but the doctor is vital for patching you up and keeping the Hero posse going one bandage at a time. These are resin castings, each coming in two pieces, with the arm holding the collection jars being separate. The collection jar is a special piece of Starting Gear that helps define the character. These are superb sculpts and will no doubt, see use in other Wild West games. The standard of sculpting with the new resin figures for Shadows of Brimstone is very high. Height-wise, they are very compatible with the Tombstone figures from Black Scorpion or the Knuckleduster 32mm scale range of Wild West figures. Legend has it that the ancestors of the tribal native humans of Jargano were originally from Earth, finding their way through an ancient portal and becoming trapped on the other side. Struggling to survive for millennia against aggressive tribes of Serpentmen and all manner of vicious and primal creatures of the swamp, these native hunters of Jargano have become renowned for being perhaps the deadliest and fiercest warriors of any world. The Jargano native is a savage and primitive hunter from the murky swamp world of Jargano. Still bearing his or her tribal weapons and gladiatorial skills, learned in the savage, pre-historic lands of his home, the Jargano native is an expert tracker, hunter and hand-to-hand fighter. Though they do not understand written language or technology, their keen senses and combat reflexes make them a fierce addition to any posse. These resin cast figures came in three parts with both arms being separate pieces. The person who sold them to me had added a bow and quiver of arrows to the back of the male warrior. I thought that this was an excellent idea, as they are skilled in archery. Note that their daggers have been painted to represent flint and not metal. I have painted them with bronzed skin, so they could double as native Americans in a standard Wild West game. Another option is to use them in a pre-historic setting, where they'd fit in perfectly. As I mentioned in my last Monthly Musings post I have been doing a lot of work on my Wild/Weird West project, including painting lots more figures. The eight figures I'm showing here are classed as Old West Allies, and whilst they were produced by Flying Frog Productions for their Shadows of Brimstone game they are generic enough to be used in any Wild West game. When Dark Stone was first discovered in the area around Brimstone, outsiders flooded in, looking to get rich. Now, they come looking to make a name for themselves (and maybe get rich along the way too). Though many of those that arrive are true Heroes in their own right, most are common folk with dollars in their eyes, blinding them to the horrors that await. Hiring themselves out as henchmen, they join up with posses heading into the dark mines. The flood of fortune seekers and merchants have also brought with them supplies and pack mules to carry the load, blacksmiths to support the effort and forge the "black rock", and faithful dog companions to help in hunting through the dark places of the world. At the far left is, of course, a blacksmith. With the discovery of Dark Stone and the rush to get rich, blacksmiths have become a good ally to have at your side. Between shoeing horses, forging the black rock and maintaining weaponry, there is more call than ever for a good blacksmith than ever before. A rugged and sturdy fighter, a blacksmith can hold his own in a fight, but can also work with Dark Stone in the field to enhance the rest of the posse's attacks. This is a one-piece casting made of plastic and he is my first Old West blacksmith figure. I recently bought the Sarissa MDF blacksmith's building, which I have yet to make, so he'll be right at home in there. The next three figures are assorted henchmen. Mercenaries and hired hands, henchmen are the easiest ally to find. Everyone and their brother it seems (often literally), has come to find their fortune in the battered lands around Brimstone. But most do not realise the terrors that dwell down in the mines, and the probable gruesome fate that awaits them. These plastic figures came in three parts - one single common body and legs, a choice of two right hands (one holding a pick, the other a pistol) and a choice of three heads. I used all three heads and both hands, but rather than duplicate the the weapons, I cut the third henchman's arm off at the elbow and remodelled it with Milliput so that his hand is resting against his pouch. Dogs are a common sight on the frontier, helping to guide cattle, protect territory, or just roaming the streets of every settlement as strays. There is no ally more loyal than the faithful dog, sniffing out valuable treasures, running ahead to scout the area for threats, or holding off hordes of creatures with their fearsome bark. This was also a one-piece plastic casting and is such a versatile figure that he could be used in so many games and genres. Pack mules are the work horses of the Old West. Loaded down with all manner of tools, gear, supplies and loot, a pack mule can be indispensable for hauling around the extra equipment and treasures collected throughout an Adventure. Though slow and non-aggressive, a pack mule can be easily spooked, kicking wildly as it finds its way out of danger. This plastic figure came in four parts - right and left body and right and left equipment packs. It is the only pack mule I have and oddly enough, it is my favourite figure out of this set. The dog comes a close second. These are the six figures that you get in the Old West Allies boxed set. Included in the boxed set are cards for Ally Specialities, giving them different abilities or gear and modifying their cost to hire. In addition, there are different types of henchmen you can hire. Figures for some of them are available from the Flying Frog webstore, which is where I got mine. The Mexican bandido is known only as Loco, although I gave him the surname of Lopez, as it is nicely alliterative. He is basically a lesser version of the Bandido Hero with his pistol and dynamite. He is a two piece resin casting, with his sombrero a separate piece. Another specialist ally currently available is the mutant blacksmith. His lower face and the right side of his torso are covered in tentacles. He would most likely be found in one of the mutant towns that are cropping up around Brimstone. He is a one piece casting made of resin. These are extremely useful figures and I am very pleased that Flying Frog are producing these generic Old West figures. Not only are they are a useful addition to Shadows of Brimstone, but they will certainly see use in my more normal Six Gun Sound campaign. I just need to give them names.